Paint the Walt Whitman Bridge rainbow to honor an LGBTQ legacy? The idea is “really nice,” said the CEO of the company that completed a $56 million refurb last year. Jan. 17, 2019, 8:30 a.m.
Philly-famous artist Conrad Benner has a big idea for his next public art project: He wants to paint a rainbow…on the entire Walt Whitman Bridge. The force behind the popular Streets Dept. blog, Benner knows a thing or two about public installations — he curated the successful Trashcan Takeover and the “To the Polls” exhibit earlier this year. But the bridge project would be much bigger than those. That’s two-plus miles of ROYGBIV we’re talking about. As it happens, the crazy proposal is also somewhat poorly timed. The Delaware River Port Authority, which oversees the bridge, commissioned a $56 million repainting only three years ago — and crews just finished the job last August. So the paint is only six months old, and by modern standards, it won’t need a refresh for at least another 25 years. But Benner wasn’t thinking about refurbishment when he came up with his idea. The goal is to honor the bridge’s namesake — and Whitman’s little-discussed queerness — with a giant pride flag on his biggest namesake memorial. Still, the project would be no simple undertaking. 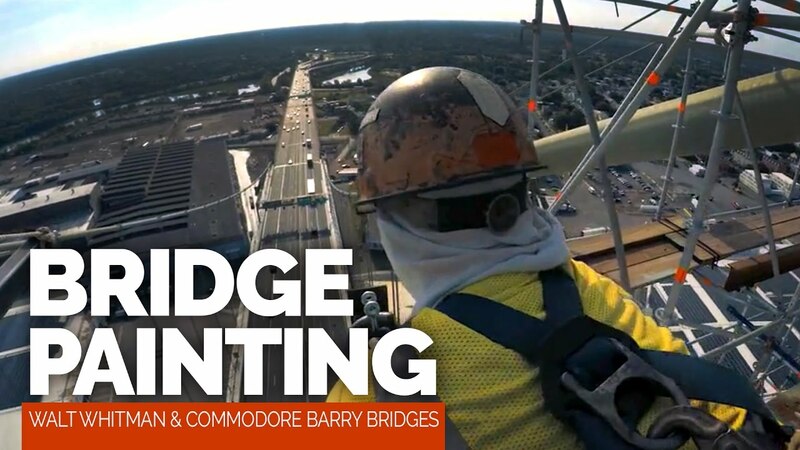 Painting a bridge from start to finish takes tens of millions of dollars, plus commitment from about 75 employees who work on the job full time for three years. They have to first build platforms under the bridge where they can stand, then clean and spray paint every inch with four coats. It’s so hard, in fact, that there’s a whole documentary about the Whitman repainting job (complete with suspenseful voiceover). The Delaware River Port Authority couldn’t be reached for comment at press time. To gauge local interest, Benner started a change.org petition on Tuesday evening for the project. In less than a day, Benner met his goal of 500 signatures, and then exceeded it — so he upped the goal to 1,000. The good news: Benner’s in the very beginning stages, so he’s willing to be flexible. He suggested he might apply for grants to paint the bridge — or just convey a similar look at night by projecting a rainbow onto the bridge. Bridge repainters worked for three years to spruce up the Walt Whitman. And Benner acknowledged the idea might not come to fruition at all. He just wanted to see if it could. What would Lymas, the Whitman-painting expert, suggest? Perhaps painting just the towers would be more feasible than the entire bridge.